We celebrated labor day this week by talking about what different jobs there are at our school. There were a lot of familiar faces in Cara’s book and the students in all our groups got so excited when they recognized someone. 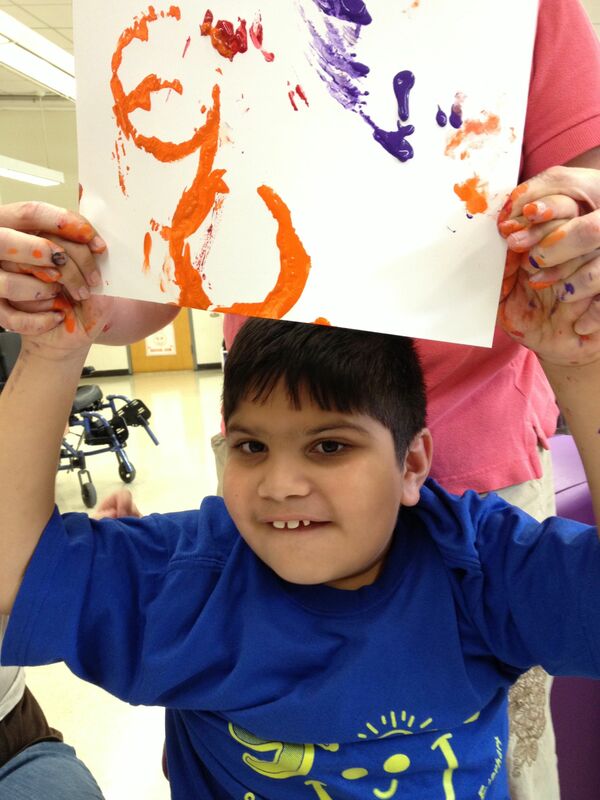 One of our students was able to verbalize what the music and art teacher did right when seeing their picture! 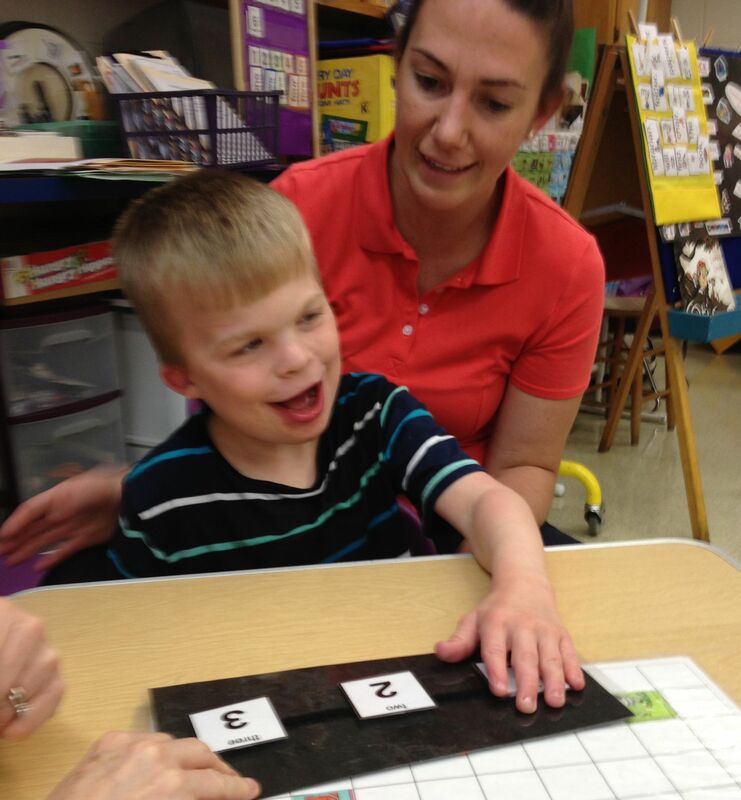 One of the most important jobs at school is “teacher”—the person who helps us learn to read and count! We have some pretty fabulous ones at our school 🙂 and for their box we used our blue moonsand—-one of our school colors is blue! 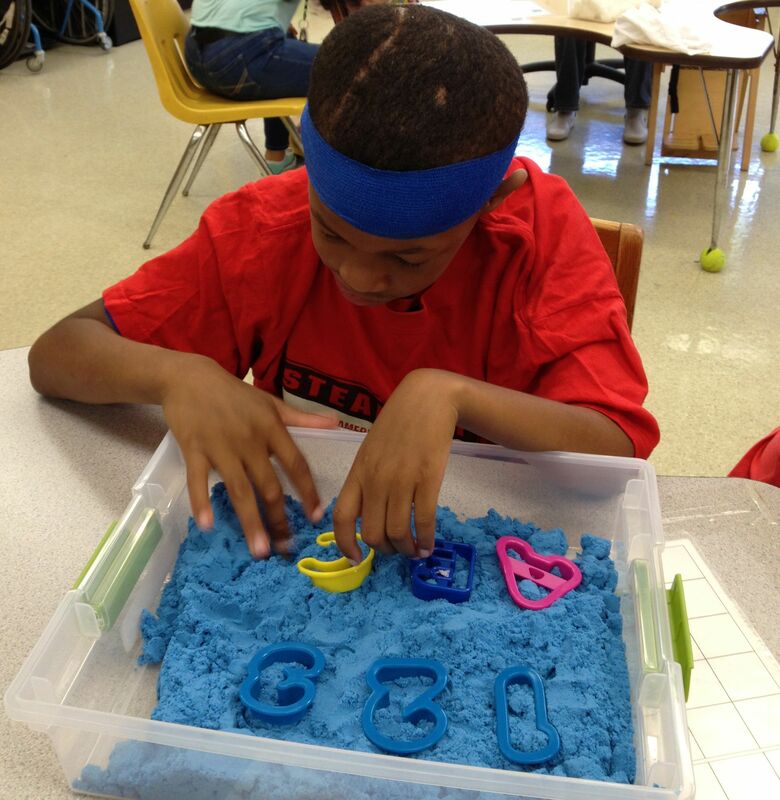 Our students had the choice of pressing A B C or 1 2 3 cookie cutters into the sand. 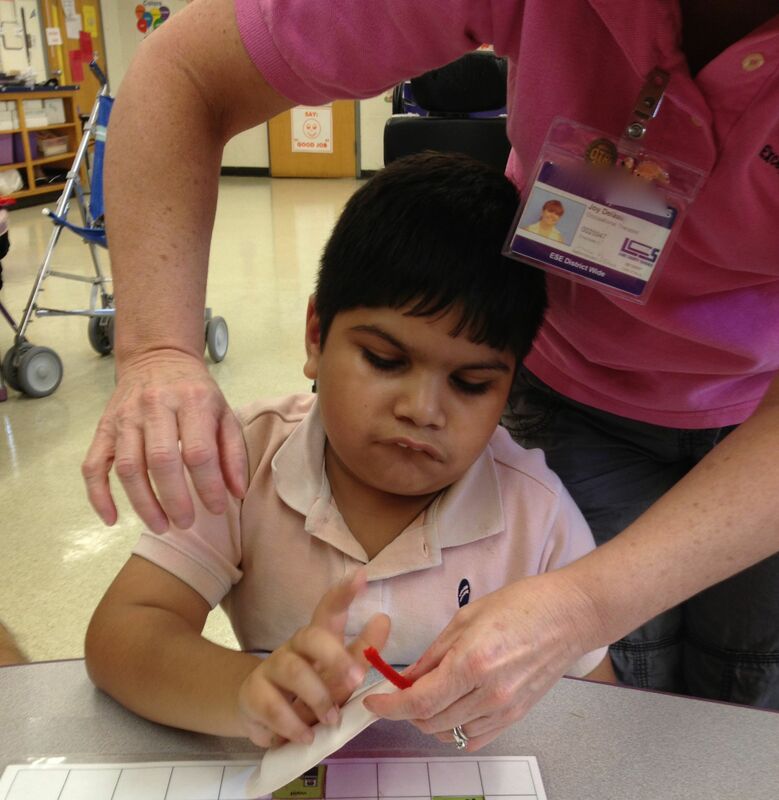 Pushing the cookie cutters helps strengthen hand intrinsics as well as working on letter and number identification. 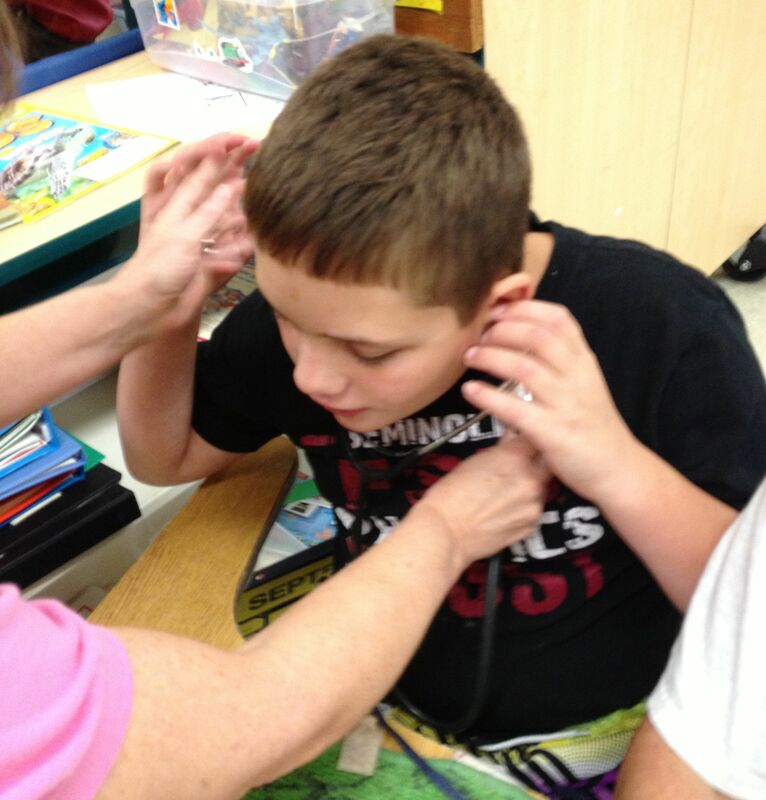 Our students really love music and we had such fun with our “music teacher” box. We brought out our shakers—lentils in one bottle and acorns in another—-and recorded some lively music on the voice output device. 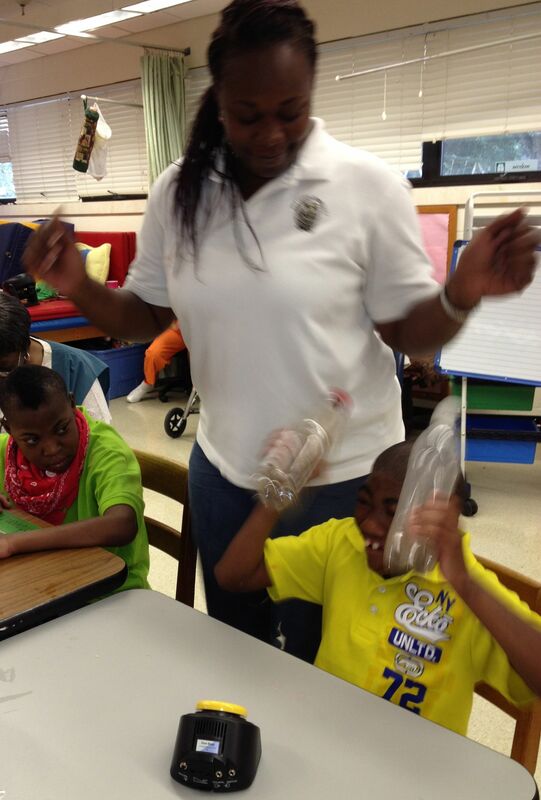 This activity addresses the language access point of responding to rhythm in familiar songs. By pressing the voice output device, students address the math access point of indicating a desire for more. 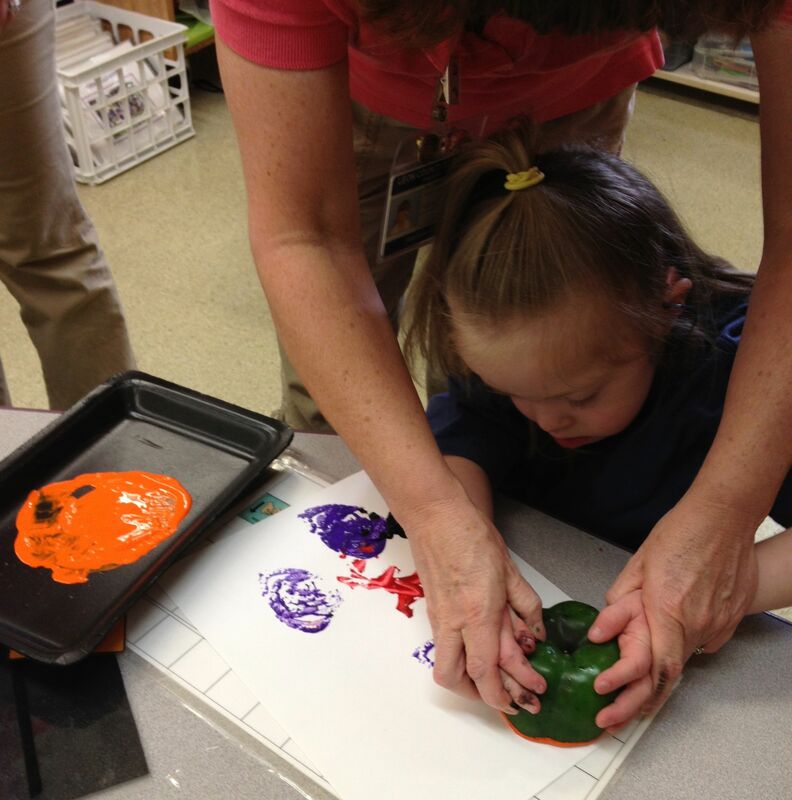 Who doesn’t love art—-especially when it involves finger painting! 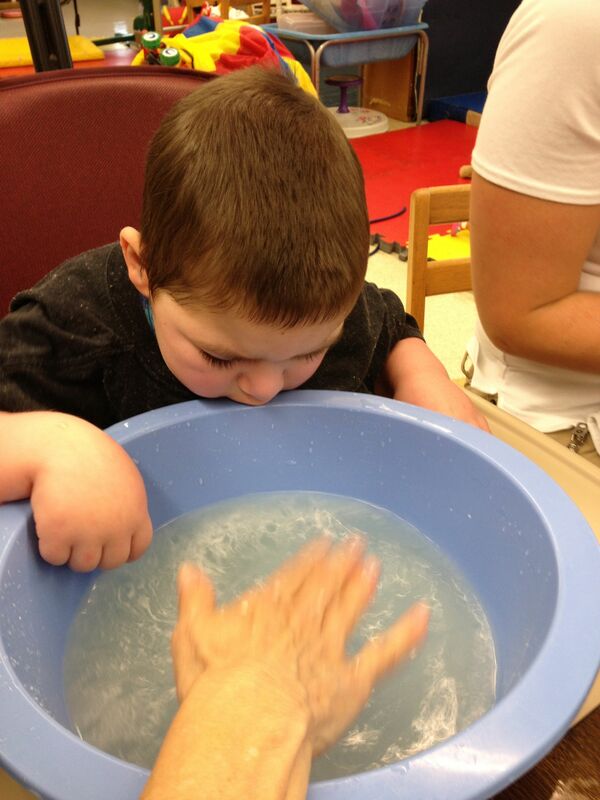 Our sensory group version was shaving cream with food coloring. Messy fun, always a favorite with us. 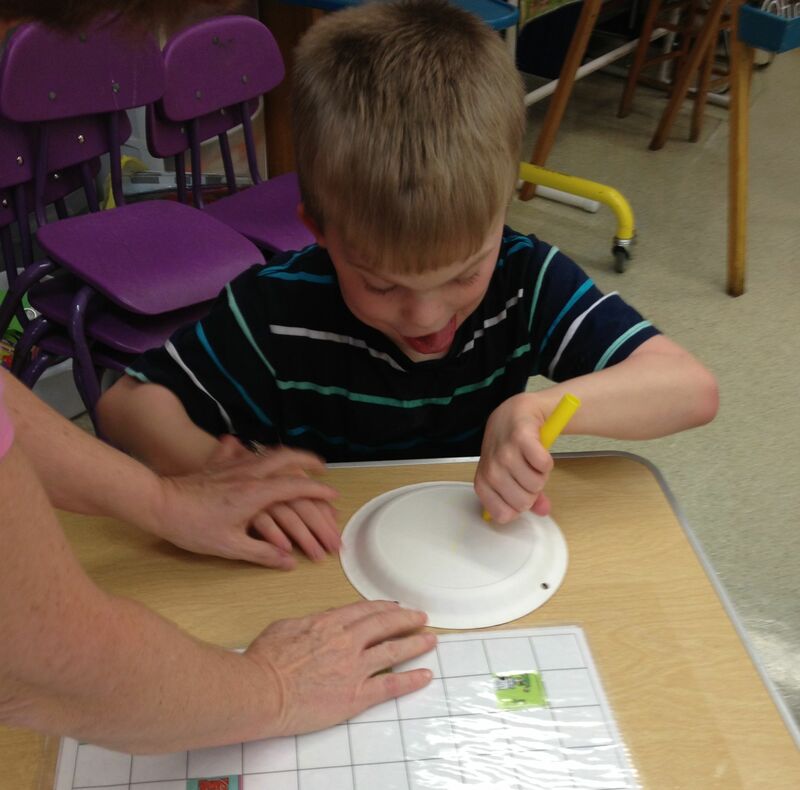 It’s a great tactile experience but also an opportunity to practice prewriting designs and letters. 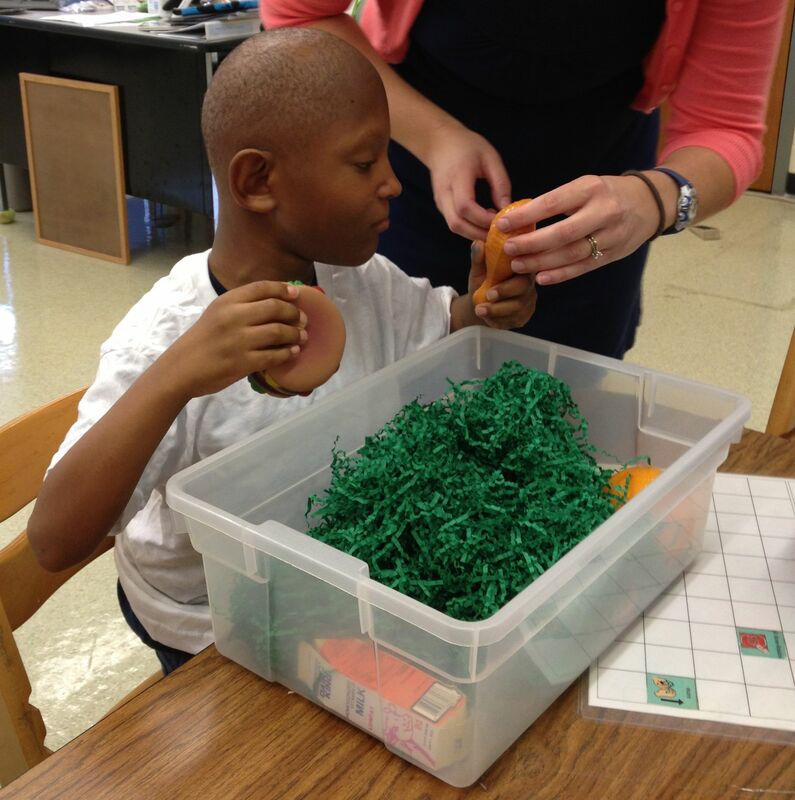 This activity also addresses the science access point of recognizing and responding to one type of sensory stimuli. 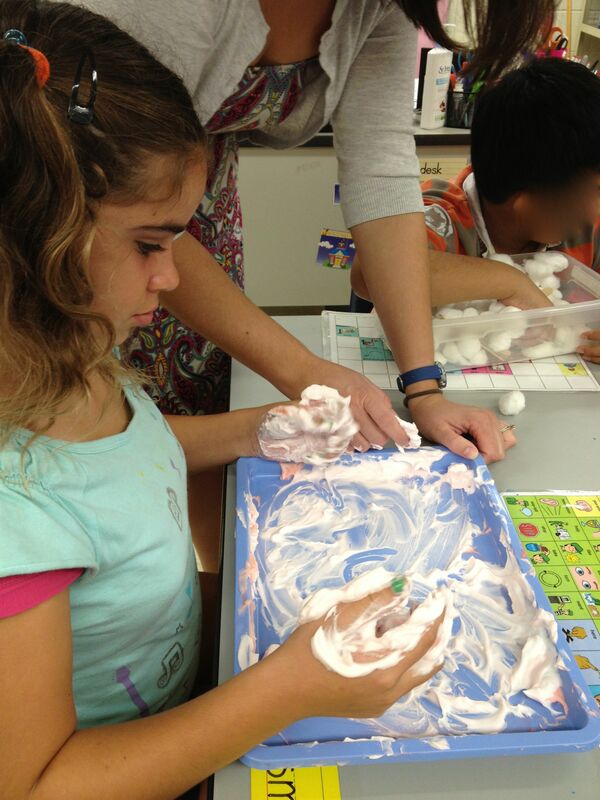 As the food coloring is mixed with the shaving cream, the science access point of recognizing a change in an object is addressed. Water play is always fun, whether in the swimming pool during PE or our little splash pool! 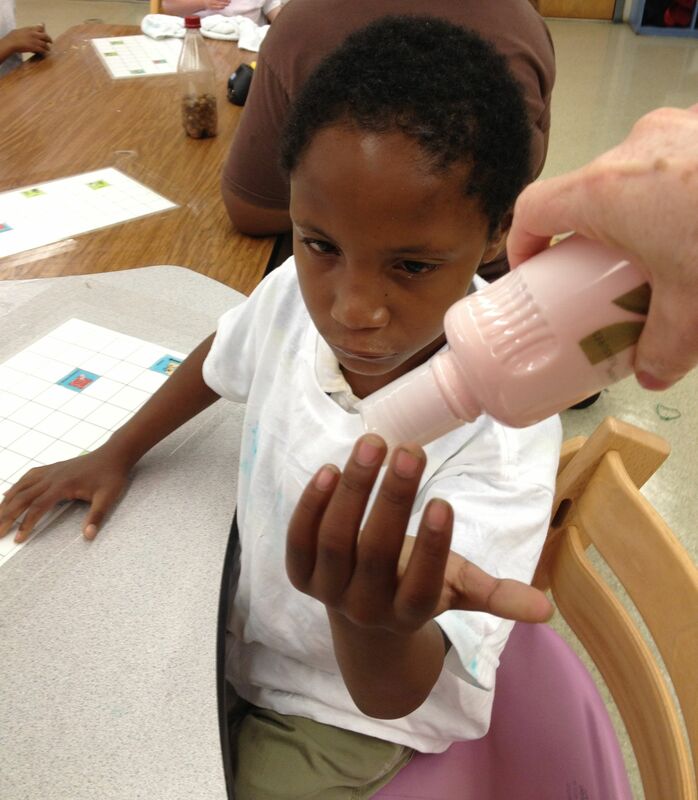 As hands—both little and big—splash the water, the science access point of applying a push to move an object is addressed. 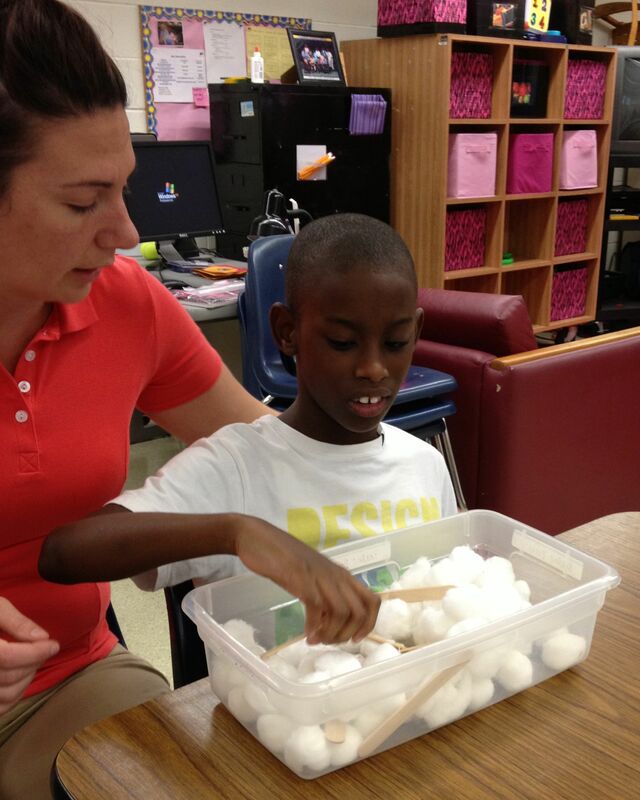 We used SOFT cotton balls and HARD tongue depressors for our “nurse” box. 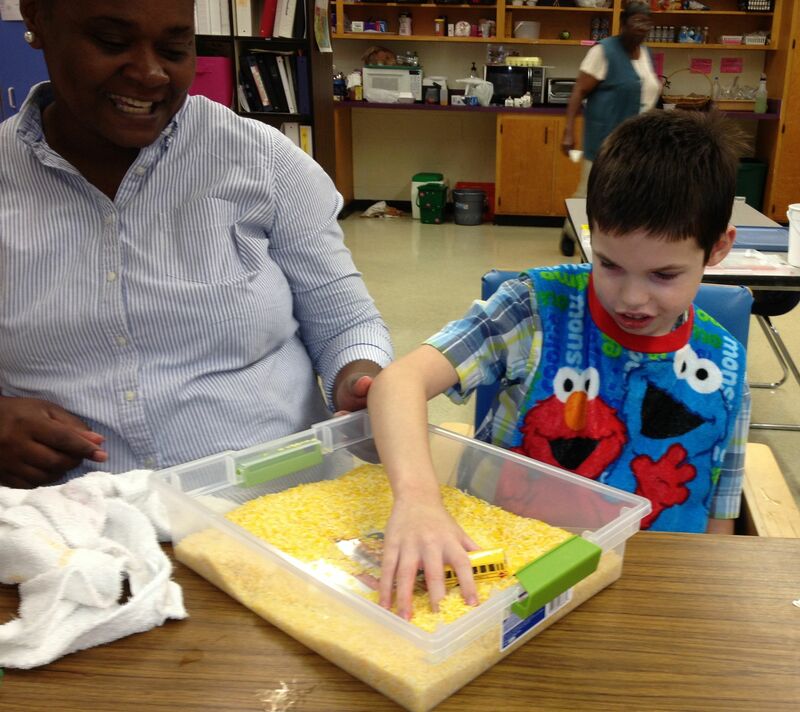 Some of our students enjoyed sorting the items by texture, practicing counting or even imitating some letters! The science access point of recognizing common objects as identical to each other can be addressed here. This also addresses the math access point of recognizing two objects that are the same size or color. LUNCH—everyone’s favorite part of the day 🙂 Our lunchroom staff serve us lots of choices of yummy food! We filled our box with some green paper shred “lettuce” and a variety of play food. Eating utensils, an identification card and a mini lunch tray. The math access point of recognizing common activities that occur every day can be addressed with this box. 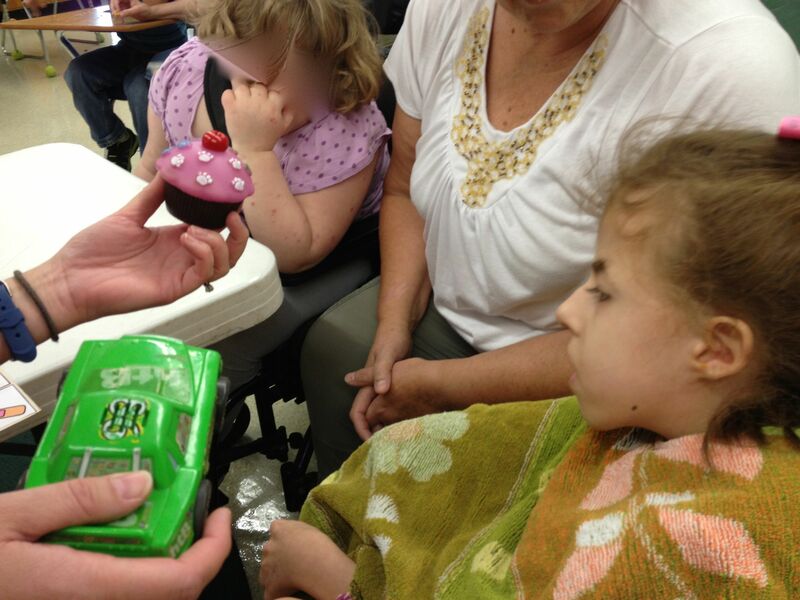 In addition, the science access points of recognizing models of real objects and recognizing that people need food can be addressed here. One of the most exciting jobs at school has to be “school bus driver”. 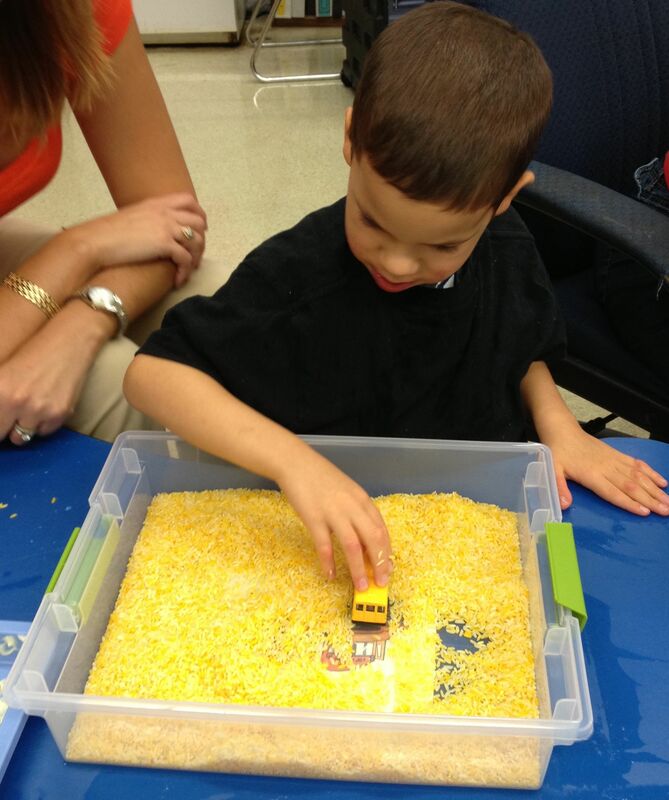 Our students love their big yellow buses and drivers! Our yellow rice was wonderfully bright and perfect for driving a little bus around in. A picture of the bus was also taped to the bottom of the box. The science access points of applying a push or pull to move an object and recognizing models of real objects are both addressed in this box. Our students are always given the opportunity to communicate their preferences for the week’s scent and this one was pretty much a favorite of everyone. 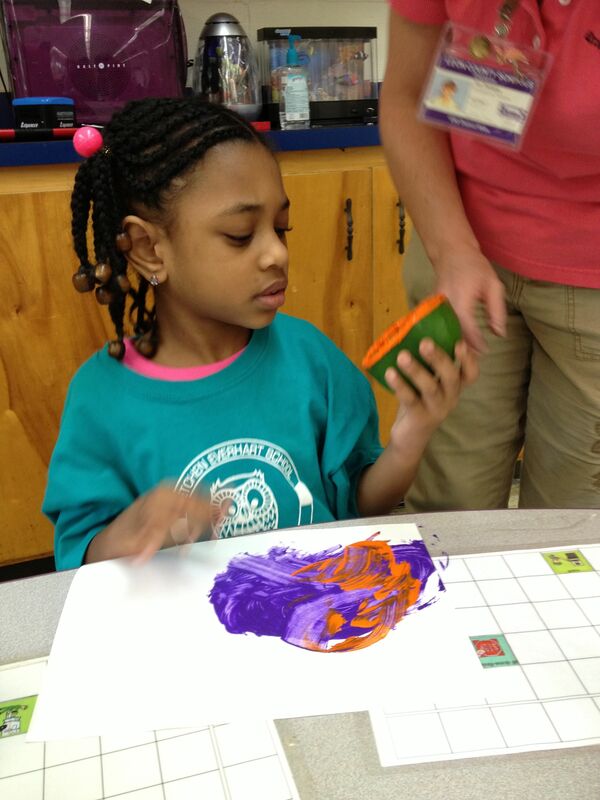 On Tuesday we stamped with an assortment of fruit and vegetables—-on rectangle shaped paper. just like those we get at lunch! The math access point of recognizing 2 dimensional shapes is addressed here. TA DA—-didn’t these turn out so cute and colorful! 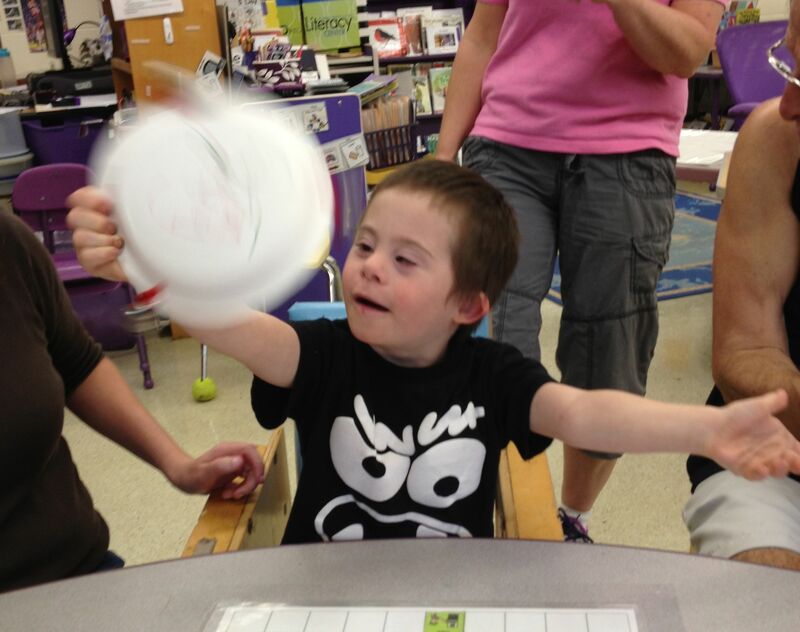 On Thursday we made paper plate tambourines. We started by counting out our circle plates and then decorated them with markers. You may notice our students don’t always have a perfect “tripod grasp” of their writing utensil but we feel that active involvement is more important than perfect grasps. We counted the bells as they were strung, asking our students to find the number on the communication board—–they did an awesome job, we were so proud!!!!! We used the same pictures of the people used in our book and Boardmaker symbols for pictures of what each person could be associated with at school. We taped the people on the left side and the picture symbols on the right side of a piece of board. Using black yarn that was connected to each of the pictures of people, the students had to figure out what picture symbol went with which person. 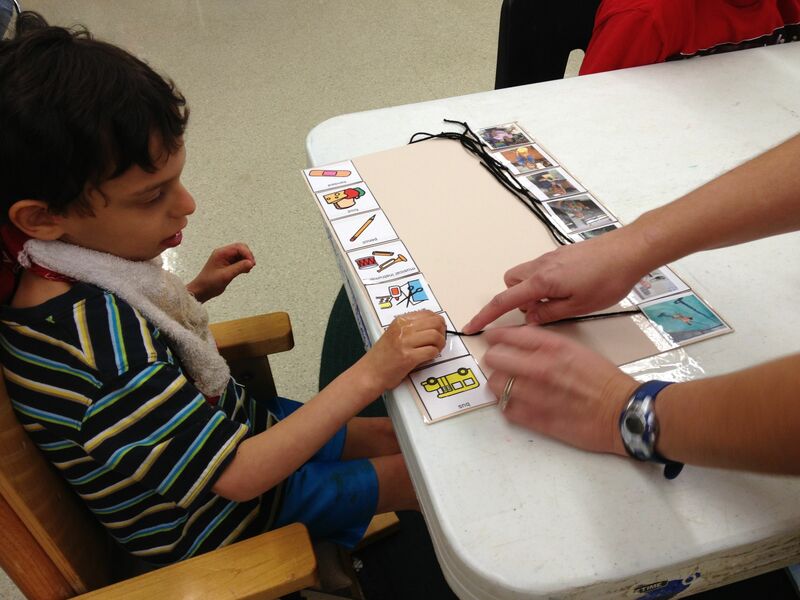 This activity addresses the language access point of recognizing familiar persons and objects associated with routines. For our students who needed more support to understand the concept, we used auditory scanning and had them answer yes or no or eye gaze to indicate their choice, for example “Does the music teacher use a bandaid? Does she use a paintbrush? Does she use musical instruments?”). After finding the correct picture symbol, Cara modeled the PIXON symbols “she uses this” and had the students verbalize if they were able to or point in the correct order if they were unable to vocalize. This addresses the language access point of communicating information about familiar persons, objects, or actions, using non-verbal expressions, gestures, signs, pictures, symbols, or words. 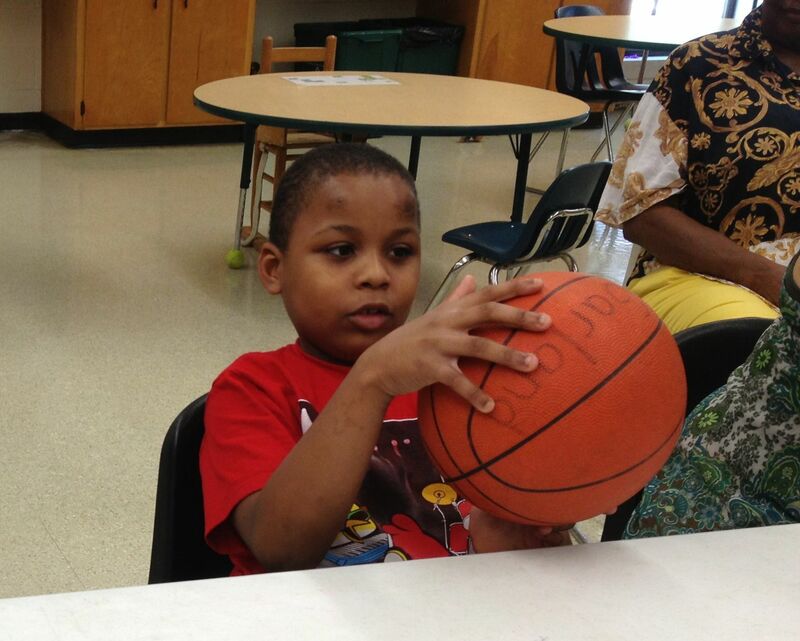 For some of our students with visual impairments and also for the students that do not have a great understanding of pictures yet, we used real objects, including: paintbrush for the art teacher, maraca for the music teacher, ball for PE teacher, stethoscope for nurse, play food for lunch lady, and a recording of bus sounds for bus driver. This worked out SO great and made it more meaningful for ALL the students.